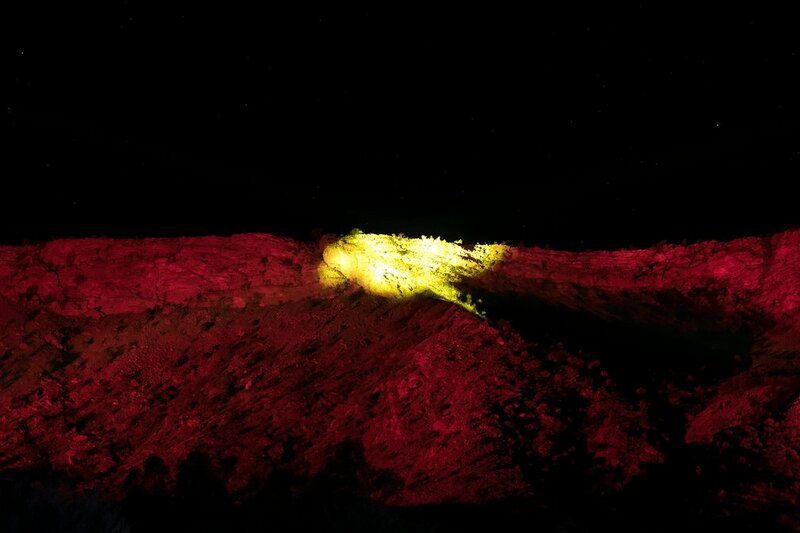 The success that has been the Vivid light festival in Sydney is about to go bush; two and a half kilometres of the West MacDonnell Ranges outside Alice Springs will light up for 2 weeks from Friday. And, just as visitors have been able to alter the light patterns and colours on the Sydney Harbour Bridge, so those who head out to the Desert Park from 6.30 every evening will be able to paint with light over that mighty stretch of ancient rock – mainly red quartzite – known in Aranda as Tyurretye. But that's not all! While that activity might seem like a massive selfie, there's also various forms of local art all round the visitor. There are 8 metre illuminated caterpillars – for the Yepereneye turned themselves into the West Macs many millennia ago; there are 4 metre diameter Hermannsburg paintings converted into giant skirts swirling in the evening breezes; and there are even larger projections of traditional map-making paintings on the ground, requiring a grandstand to view them properly; “Taking Country back to Country”, as Giles Westley, the event's Artistic Director explained it. All this has come from an idea proposed by Westley's company, AGB Events, the company that has come up with many a Vivid spectacular in the past. The idea was taken up and run with by the NT Major Events Company – a government instrumentality. A year's worth of negotiations then followed with Mbantua's Traditional Owners to ensure that no secret/sacred sites were desecrated; with the result that an area of the West Macs associated with the important Dog Story will not be illuminated. Sadly, the “burden of custodianship” as Giles Westley refers to it meant that different TOs thought they should have been consulted about decisions. And certainly there is a minority view around this small town that it's all been imposed on them by outsiders. But, in the end, the organisers are convinced that they have “engaged with the community to tell the stories it wants to”. And behind the big light-up is a keen desire by both sides to use the event as a way of passing story on through the Aranda generations. So story-tellers took kids from the Amoonguna town camp out on site to give the lowdown on how those Yeperenye formed the West Macs. Back in school, the kids drew their caterpillar impressions, and these now form the designs on three monstrous light-filled, creation-force creep-crawlies – around which people can flit like moths in the old story. A soundscape from an Elder will bring that story to life again. A newer jukurrpa relating to the almost legendary Albert Namatjira also plays its part in the event. 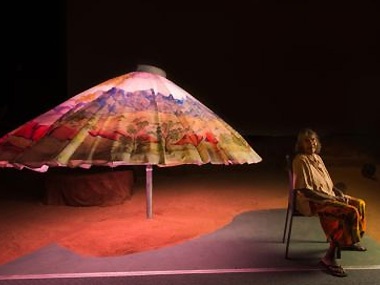 For all the giant skirts and the ground paintings come from descendants of his working at the Iltja Ntjarra Many Hands Art Centre in Alice Springs. According to Westley, Albert's grand-daughter Lenie Namatjira was moved to tears when she saw her circular Mt Sonder (Arkutja) painting enlarged and illuminated. When I spoke to her, she didn't go further than “It looks pretty good lit up in the night. But I hope the young ones who see it will listen to my story about the woman lying down – which is how we see the mountain – after travelling all round Australia and deciding 'This is a good place for my people'”. For Lenie, continuing the water-colour tradition of her grandfather has been a vital part of her life since she was 16; and she's disappointed that only one or two of that generation come into the art centre today. “They go to the casino”, she complains; “too much thought and patience are needed for painting”. Other Hermannsburg families have also supplied circular images of Country – Hubert and Ivy Pereroultja, Reinhold Inkamala and Therese Ryder. The ground paintings mapping Mbantua that will be viewed from grandstands over a 16-minute presentation are dominated by the Rubuntja family – Wenton and Mervyn – with Gloria Pannka's beautiful flowers, Hubert Pereroultja's early Papunya-style board and Myra Ah Chee's abstract work that inadvertently reflects the microscopic diatoms that were the ancient building blocks of life in this most ancient of places adding variety. . Attendance at Parrtjima is free and buses are running from town and the town camps to and from the Desert Park. But registration for the nightly, two-hour sessions (6.30 and 8.30) is encouraged, and thousands of locals have already sign-up. Ads for Parrtjima on 'The Australian' website suggests that tourism is also expected. Catering on site is available. And it's a four-year project with variations always possible as a result of the discussions likely to emerge after this debut year. Having been in Alice for Desert Mob earlier in September, I'd question whether holding it then would make that event even more attractive. The weather was certainly perfect for a night out under the stars. Different artworks will certainly be included in future years; and a different site is always possible, according to Giles Westley. “Simpson's Gap next time??? Honeymoon Gap might be even better”, he speculated. “We're certainly looking forward to the challenge – though our warehouse in Sydney is empty as we start to set up the 100s of lights that are going to celebrate the artists and the vibrancy of Alice Springs”.